NEW ORLEANS – The NCAA Division II Women’s Cross Country National Coaches’ Poll released by the U.S. Track & Field and Cross Country Coaches’ Association (USTFCCCA) on Wednesday saw little movement despite some great competition this past weekend, which included the Rock Pre-Nationals and the Western Washington Classic, among others. 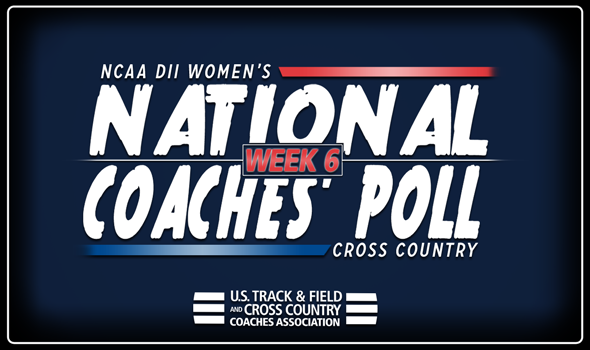 Most of the top teams in the country elected for rest but the weekend results did shake things up slightly as a new program moved back into the top-five and five of the top-10 teams experienced some kind of change. Adams State kept the No. 1 spot in the country for the seventh consecutive poll after once again picking up all eight first-place votes. It is the most time spent atop the nation to open a year since Grand Valley State held the top spot for the entire 2014 season. The Grizzlies were off from competition this past weekend and will next race at the Rocky Mountain Athletic Conference Championships on November 3. Holding in the No. 2 position was Western State after the Mountaineers won its 68th Annual W Mountain Race over the weekend. Amelia Strahan paced the group as she collected the meet’s individual title. It was the final tuneup for Western State before the Rocky Mountain Athletic Conference Championships on November 3. Also experiencing no change was No. 3 Grand Valley State who too was off from competition. The Lakers last raced at the Bradley Pink Classic on October 12 and will return to action by hosting the Great Lakes Intercollegiate Athletic Conference Championships on November 3. No. 4 U-Mary also held in its previous position after the program won the NSIC Preview over the weekend. The Marauders scored a perfect 15 points and were paced by individual champion Jaiden Schuette who won the event by nearly 22 seconds. U-Mary will race next at the NSIC Championships on November 3. Jumping up one spot and back into the top-five was No. 5 Colorado Mines after an impressive showing at the Rock Pre-Nationals. Megan Wenham took home the individual crown and the Orediggers placed three of its top-5 runners in the top-7 to take the victory by a 54-point margin. Colorado Mines will be back in action at the Rocky Mountain Athletic Conference Championships on November 3, setting up a top-5 clash with Adams State. Improving one spot into a tie for No. 6 was Chico State. The Wildcats won the UC San Diego Triton Classic this past weekend without two of its top athletes in attendance. Alexandria Tucker paced the group as she placed third overall. The Wildcats return to the course for the California Collegiate Athletic Association Championships on November 3. Falling one into a tie for the No. 6 spot was Augustana (S.D.) after picking up the team title at the Mount Marty Invite over the weekend Aver Selberg led the way for the Vikings in sixth-place as an individual. The program will be ready to go for the NSIC Championships on November 3. No. 8 Simon Fraser improved two spots after a second-place finish at the Western Washington Classic this past weekend. The Clan were the top NCAA team at the meet and were edge out by Club Northwest for the team title. Addy Townsend led the squad with a fifth-place finish. Simon Fraser will next run at the Great Northwest Athletic Conference Championships on November 3. Holding pat at No. 9 was UC-Colorado Springs after an off-week from competition. The Mountain Lions last ran as a complete team at the Roy Griak Invite back in late September and will take to the course next against a stacked field at the Rocky Mountain Athletic Conference Championships on November 3. Falling two spots to No. 10 was Alaska Anchorage after a third-place performance at the Western Washington Classic over the weekend. They finished as the second DII program at the meet and Emma Chelimo kept her perfect season alive as she paced the Seawolves on her way to picking up her third victory in three races this year. Alaska Anchorage will next go at the Great Northwest Athletic Conference Championships on November 3. Overall, 15 of the top-25 teams experienced some kind of movement in this week’s poll. Six previously ranked programs saw improvement while six teams experienced a slight fall from last week. Three new teams also entered the poll in No. 18 Southwest Baptist, No. 20 Roberts Wesleyan and No. 22 Missouri Southern. It was the best mark received by Southwest Baptist since 2017 and the highest by Roberts Wesleyan and Missouri Southern since the 2014 season. The biggest improvement by a previously ranked program went to No. 15 Oklahoma Baptist who climbed four spots from the previous poll. It is the second-best rank received by the Bisons in program history. Tampa, Alabama-Huntsville and Mount Olive also received votes.